In 1853, while Lizzie was known as Gabriel’s pupil, she painted in his studio while he was visiting the Scott (William Bell Scott) family in Newcastle-on-Tyne. Gabriel mentions this in a letter to his brother, William Michael Rossetti. I believe that this was when Lizzie painted her only self portrait. I have been here since Friday, and do not exactly know what I mean to do. Let me know what your moves are to be, how long your holiday is, etc., in case we should be able to combine at all—and whether you have any plans about the rent, which is due on the 24th. I think I shall not stay here long, as I find the general stagnation too like the spirit of Banquo, except for a strenuous dog, from whom also I suffer much. David Scott is a tremendous lark. I want to tell you that Lizzy is painting at Blackfriars while I am away. Do not therefore encourage any one to go near the place. I have told her to keep the doors locked, and she will probably sleep there sometimes. Tell me any news; I have none to tell. I suppose you are probably at Frome. . . . 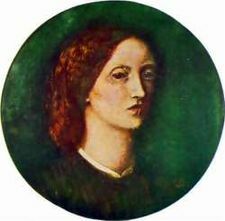 I have heard several of Scott’s poems, some very fine, and am going to do the etching for his Rosabell, as I proposed. By-the-bye, I mentioned to him that affair of The Artist, and that they would have etchings; that Brown was doing one, etc. ; and he asked me yesterday whether I thought it could be managed to get them to buy some of those Commonwealth etchings of his. They are really very good, but I do not know whether you could mention it at any time. You will know best. I suppose, if you write to me here, it can be sent on in case I have left.